Most movie fans have heard that of all the engagement rings Jennifer Lopez ever received (she’s had four of them), the 6.1 carat pink diamond engagement ring from Ben Affleck was the most spectacular. That Harry Winston ring reportedly cost all of $1.2 million, and this made quite a good number of people interested in the investment value of coloured diamonds. In addition to this, many jewelry stores have found new marketing strategies to promote diamonds that were once difficult to sell. 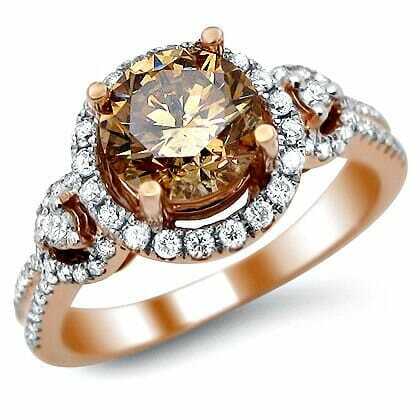 Brown diamonds, for example, are now being referred to as champagne or chocolate diamonds. These are quite often combined with white diamonds to create dramatic impact. Colour is indeed one of the criteria that jewelers use to assess the value of diamonds. If you are planning to buy your loved one an engagement ring, it would be good to learn a few basic facts about the colour of diamonds and which colour grades will allow a diamond ring to increase in value over time. The colour of diamonds comes as a result of structural defects and impurities caught in minute intervening spaces within the stone as it develops. This means that all things being equal, a diamond that is totally devoid of colour and nearly transparent is “purer” and will generally command a higher price than one that has a tinge of gray, or brown. For example, if you see several rings of exactly the same design, set with diamonds of exactly the same cut, clarity, and weight, the diamond ring with the whitest stone would be substantially more expensive than the rest. In nature, diamonds come in different colours white, yellow, steel gray, blue, purple, orange, pink, red, green, brown, and black. A diamond’s colour will depend on the impurities found within it. Most diamonds have nitrogen atoms, which give them a yellow to brown tint. 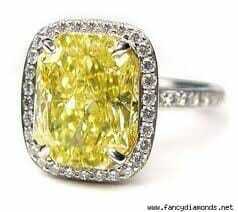 Some diamonds with nitrogen impurities possess a vibrant canary yellow colour, which is a very rare occurrence. Stones of this colour are extremely expensive, and their value will increase very profitably as years go by. Scattered boron atoms within a diamond’s crystal matrix will give it a blue tint, while radiation can cause the gem to acquire a greenish shade. Sometimes, because of anomalies within their crystal structure, diamonds will be a shade of pink or even red. Like yellow diamonds, natural pink and red diamonds are extremely rare and valuable. Since these special colours only occur in about less than 2% of diamonds mined, their value is sure to increase at a very favorable rate over the years, barring the discovery of large quantities of this type of diamond. When gemologists grade diamonds according to colour, they use two grading systems: one to grade “normal” diamonds, and another to grade “fancy” diamonds. Most diamond rings have center stones graded under the “normal” classification. These stones come in a range of colours from white to slightly yellow to brown. They are graded using a scale that rates them according to how close (or how far) they are from being white or colourless. Diamonds that have almost no impurities will be totally devoid of colour, like drop of water. They will have a bright white appearance when reflecting light. When normal diamonds are graded, the degree to which they are coloured is one of the four factors by which they are assessed. The less colour they have, the more desirable they are in gemological standards. Diamonds that come in intense yellow, or brown, or any other colour are referred to as fancy diamonds; these are graded according to a different scale. Recently, fancy coloured diamonds have become quite popular as center stones for engagement rings. Many jewelers that cater to a trendy clientele include artificially coloured diamonds among their display, but these are not to be confused with natural fancy diamonds, which come in various colours without the aid of scientific intervention. Technically speaking, diamonds are not graded according to the “normal scale” once they come in any shade other than light yellow or light brown. Instead, these are assessed as fancy diamonds and graded according to the presence and the characteristics of their colour. Today’s colour grading system for diamonds within the normal range starts with D and goes all the way to Z. The Gemological Institute of America (GIA), the International Gemological Authority (IGA), as well as other internationally known laboratories uses this system. 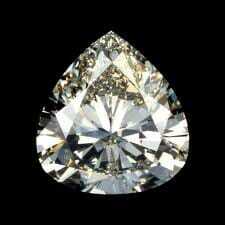 It designates a D grade for diamonds that are colourless and Z for those that are pale yellow or brown. Beyond a Z grade, a diamond becomes classified as fancy. To assess a diamond’s colour, a trained grader puts it in a lighting box where controlled daylight equivalent lights are installed for precise viewing. He then compares it against a set of master stones, stone samples that have the very least amount of colour for each of the different colour grades. The distinctions in colour within each grade are not visible to the naked eye; in fact these may be so subtle they can only be detected by a trained grader using special equipment. 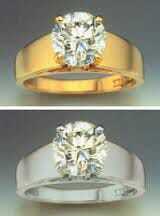 However, distinctions even within a grade can make a big difference in the quality and price of a diamond. 1. D, E, F = Diamonds falling under these grades are considered colourless. When placed against a piece of white paper, the absence of colour in D grade diamonds becomes very evident. If you have the good fortune to have a diamond falling under these grades, a wise move would be for you to make sure it is set in platinum or silver to highlight its superior purity. If, aside from having a D colour, your diamond is also well cut, more than a third of a carat in wait, and free from any visible inclusions, it would even be worthwhile to make the most of your treasure and have a custom-made engagement ring with solitaire setting. 2. G, H, I, J = Diamonds in the G to J category will have very slight traces of colour. G is often referred to as white, H as top commercial white, and I as commercial white. These are more common, and are substantially lower in price than D to F diamonds. Stones within this colour grade can still be set in white gold or platinum – metals which tend to betray any hint of colour. In terms of price, there is usually a 10 to 20 percent difference between diamond grades. A diamond rated D can cost twice as much as one graded I or J. 3. K, L, M = The colour of diamonds begins to be visible to the naked eye when they are graded K, L, or M. Usually, a K diamond will cost half as much as a G diamond. Often endowed with a yellow tint, diamonds graded K, L or M is often set in yellow gold. This implies that engagement rings made with grade L diamonds, are best set in yellow gold, and their accompanying wedding rings would have to be in the same type of setting. 4. N, O, P, Q, R = Diamonds rated N to R have an easily discernible yellow or brown tint and their value appreciates at a much slower rate than those in the higher categories. Most high-end stores will not carry stones of this grade because the demand for them is not as great. 5. S to Z = Diamonds in this colour grade are unmistakably light yellow or light brown. Unlike H diamonds, which most people would say are white with a tinge of yellow or brown, diamonds in the S to Z are definitely more yellow and brown than white. As a rule, diamonds graded from D to G are more expensive than those graded lower, but they also appreciate in value a lot more through the years. Investment wise, where diamonds in the normal colour range are concerned, the whiter, colourless diamonds are a better proposition. However, colour grading for this purpose, is not dependent on what the naked eye is able to discern. The metal setting, the lighting, and the external environment all affect the way a human eye will perceive the colour of a diamond. Professional help is called for. To illustrate, viewed under normal light, a wedding ring with H grade diamonds may look the same as a wedding ring with D grade stones. If both rings are made with yellow gold, the colour of the H stones becomes even less discernible. This means that if you are buying diamonds or diamond rings as an investment, you should buy stones that have been officially certified by a qualified institution. Not everything is as it seems. It is easy to be mistaken about the real colour of a diamond. To be sure about a diamond's colour grade, go for stones that are certified. The larger the diamond, the easier it is to detect colour. The bigger the diamond you plan to purchase, the more colourless it should be. For the sake of aesthetics and ease in resale, buy G to H diamonds when purchasing stones weighing 1 carat or more. Stones weighing less than1 carat can have a colour grade of I to J and still look colourless with the right setting. Higher colour is not the only factor in a diamond's over-all appearance and long-term value. Cut is just as important because it allows the diamond to have brilliance and luster. As a rule, within reasonable bounds, a lower colour grade diamond that is well cut will have more sparkle and appeal than a diamond that has a higher colour but a lower cut grade. Cuts with more facets (round, princess, trilliant, etc.) tend to hide colour better than shapes with fewer facets (emerald, Asscher, etc). Balance cut with colour when you choose a diamond. If you like fancy diamonds and have the budget for it, go ahead and get a natural coloured diamond. Just make sure you consider the other C’s (clarity, cut, carat) when you make your choice, and you will have a good investment in your hands. Gemologists will always say that the higher grades of colourless diamonds are the best investment, exceeded only by the purchase of a pink, red, or canary yellow diamond. However, sometimes, people's tastes may take them to another direction. In this case, who is the best person to decide which diamond is the best choice - if not the one who will be wearing it? Some diamond colours are considered less desirable than others are. Diamonds that are graded G to M are considered 'low colour', and diamonds graded above are called 'High Colour'.However, even diamonds graded Z, such as brown diamonds, experience moments of popularity. With the right setting, these can look very attractive. The most important thing when you buy an engagement ring is choosing a diamond ring you will be happy with as a couple for a long, long time. An engagement ring is rarely, if ever, purely a matter of investment because it is not an item you can part with simply because the price is right and a profit is to be made. This item has significance beyond monetary value. Buying a diamond can be a matter of investment, but it can also simply be a matter of personal preference. Just remember that the fundamental principle behind the purchase of a diamond ring is to provide the person you love with a tangible symbol of your lifelong commitment.